My memory of ‘The Merchant of Venice dates back to my all boy high school, to local a dramatic society productions – and was of a ‘deep and meaningful’ tragedy, which idea stayed with me through the years of stage productions and films that were more stagey than the stage. 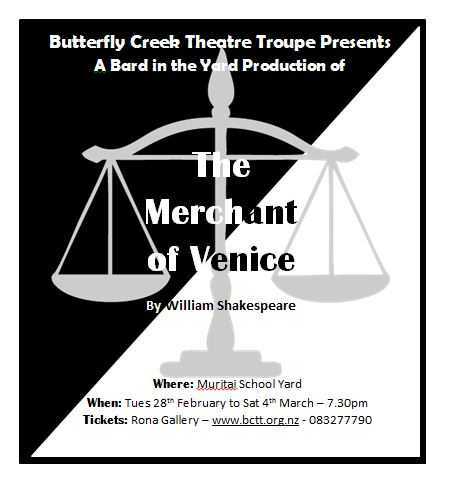 So when it was suggested that the BCTT stage ‘The Merchant’ as this years ‘Bard in the Yard’, I half seriously said I would stage it as a ‘comedy’. Then I read it again, (the first time since high school) – and found the accompanying commentaries said that Shakespeare really did write it as a comedy – even though it might not have lasted all that long as one – a bit like Chekhov’s comedies I suspect. I suppose a melancholic merchant possibly infatuated with a young nobleman; who is less than prodigal and who has this great idea to pay off his debts by marrying a wealthy heiress but needs to borrow more money to do so; and who together decide to borrow the necessary from a local Jewish money lender (at no interest) and invite him to discuss it over a slap up Christian meal – and that all this could have the makings of a really jolly jape. That is if it was not for the various Crusades, the .expulsion of Jews from nearly every country in Europe, ghettos pogroms and holocausts. Even as an object lesson in persecution we are far to close to these horrors to laugh at the potentially two dimensional Shylock. But the brilliance of Shakespeare is that he has also given us a drama full of other even more relevant social and personal issues and failings and characters – and that is what we are enjoying finding during our rehearsing The Merchant of Venice – and hopefully you will enjoy when you see it.